Kate Saffin talks to Romy Nordlinger about Alla Azimova, the most famous silent movie star you’ve never heard of. Places is the story of Alla Nazimova: 1920s silent movie icon, Broadway legend and the most famous star you’ve never heard of. From Tsarist Russia to Broadway, Alla was once the highest paid movie star in Tinseltown and the first female director and producer in Hollywood. Unapologetic about her bisexuality and lust for life, she defied the moral and artistic codes of her time that eventually forced her into obscurity. Romy Nordlinger’s multimedia solo show shares the story of one of the most daring artists of the 20th century. 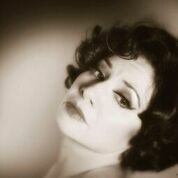 Here she talks about how she discovered Nazimova and why she is passionate about telling her story.